Trustee Tom Stoddart opened his photographic exhibition at More London on July 25, 2012 in London, England. 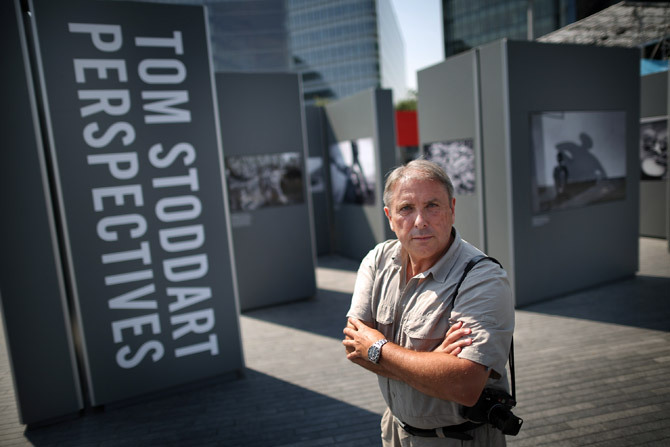 Seventy-eight of Stoddart’s signature black and white pictures form a free, open-air display at More London Riverside, between City Hall and HMS Belfast. During his distinguished career Stoddart has travelled to more than 50 countries and documented such historic events as the fall of the Berlin Wall, the Siege of Sarajevo and the election of Nelson Mandela as South Africa’s first black president. The exhibition is in participation with The International Committee of The Red Cross for whom Stoddart has worked on their Healthcare in Danger campaign initiative that aims to address the widespread and severe impact of illegal and sometimes violent acts that obstruct the delivery of health care, damage or destroy facilities and vehicles, and injure or kill health-care workers and patients, in armed conflicts and other emergencies.